There is nothing more figure-flattering than the A-Line style of dress. 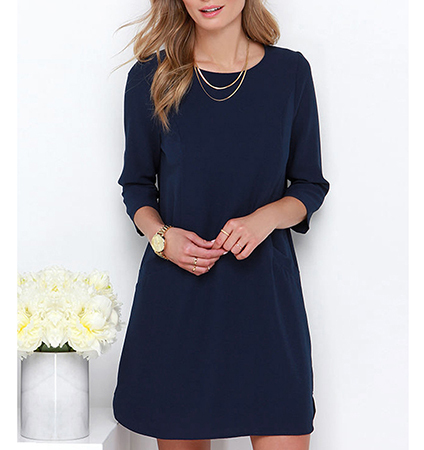 This women’s A-Line mini dress is a perfect example. It is pretty to behold, constructed beautifully, and can hide any figure flaws that you might not want others to see. It features a simple round neckline and a loosely fitted bodice. It has long sleeves that can be worn full-length or pushed up (as shown). The cut of the dress is slightly wider at the hemline to give a more balanced proportional look. The mini length of the hemline ends at the upper thigh area. This dress zips up the back with a long, hidden zipper. It is machine washable and comes available in sizes Small, Medium, Large and Extra Large.